Phenylketonuria (fen-il-kee-to-NU-ree-a) or PKU is an inherited metabolic disease in which the body cannot change one essential amino acid, phenylalanine (fen-il-AL-a-neen), into another needed amino acid, tyrosine (TY-ro-seen). Untreated, PKU often results in severe mental retardation, but if it is detected at birth and the children are put on a special diet, they can lead normal lives. In 1934, a mother with two children with mental retardation went to a Norwegian medical doctor, Asbjørn Følling. Dr. Følling became interested in the children's condition when the mother described the children's odd musty odor. The children, ages 4 and 6, had severe mental retardation. The younger child could not speak or walk, and still wore diapers. The older child could speak only a few words and had problems walking. Dr. Følling examined the children's urine and found no protein or glucose in it, but he was puzzled when their urine turned a deep green, instead of staying brownish, after he added the chemical compound ferric chloride to it. Dr. Følling expanded his study to other children whose urine had the same kind of reaction and concluded that the unusual quality of the urine seemed to be connected with mental retardation. Thus, he discovered PKU, which he concluded was a genetic error in the children's metabolism * . PKU is a disruption in normal metabolism. Normally, an enzyme * in the body called phenylalanine hydroxylase (fen-il-AL-a-neen hy-DROK-si-lase) changes the essential amino acid * phenylalanine to another needed amino acid called tyrosine (TY-ro-seen). If phenylalanine hydroxylase is missing, as it is in PKU, phenylalanine builds up in the blood and passes out of the body in urine. PKU affects on average one out of every 10,000-15,000 babies in the United States. Since PKU is an inherited disorder, there is a good bit of variation among different ethnic and racial groups. The condition is found less often in people of African descent (1 in every 50,000 babies) and in Ashkenazic Jews. Almost all babies born in hospitals in the United States are screened for PKU within 48 hours of birth with a blood test that measures their levels of phenylalanine. In families with a history of PKU, the disease can usually be diagnosed in the fetus during pregnancy. A pregnant woman who has untreated PKU herself has a much greater chance of having a baby with (often severe) birth defects. * metabolism (me-TAB-o-liz-um) is the process in the body that converts food into energy and waste products. * amino acids (a-MEE-no acids) are the chief building blocks of proteins. In humans, certain amino acids are required to sustain life. Jennifer is a happy 12-year-old with fair skin, blue eyes, and a very normal life except for her diet. Jennifer has PKU, which was diagnosed at birth through hospital screening. She cannot go out for pizza, drink diet sodas, or eat many of the common foods that most people take for granted. Aspartame is listed as an ingredient on a packet of artificial sweetener. 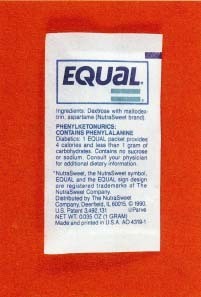 People with PKU are warned that the product contains phenylalanine. Infants with PKU must begin treatment within days of being born to prevent their becoming mentally retarded. They must eat a special diet that restricts their intake of phenylalanine and provides the tyrosine that the body cannot make. Babies drink special formula that is low in phenylalanine. People with PKU cannot have high-protein foods such as meat, poultry, fish, milk, eggs, cheese, ice cream, and nuts; products containing regular flour; or products that contain the artificial sweetener aspartame (also known by the brand name NutraSweet). They can eat low-protein foods such as fruits, vegetables, and certain cereals. Not adhering to the diet may cause serious problems like drops in IQ and problems with learning and behavior. Experts are not sure whether and at what age it is safe to stop treatment. Most recommend that people with PKU stay on the special diet for life. Once destined to become mentally retarded, people like Jennifer are now growing up normally. Most people with untreated PKU, however, have severe mental retardation and are unable to live independently. Wessel, Kenneth. A Journey into the World of PKU. Baltimore, MD: Pediatric Genetics, 1991. Children's PKU Network, 1520 State St., Suite 240, San Diego, CA 92111. PKU News posts information about PKU on its website.